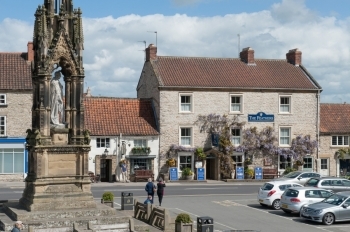 Accommodation in Helmsley, North Yorkshire. Our 7 day weather forecast for Helmsley updated throughout the day, making it ideal for planning leisure activities, travel and events. Read more about our weather forecasts. Our weather forecast for Helmsley is updated throughout the day and has been found to be very reliable for planning activities such as days out, leisure, travel, events, fishing, golf and gardening. The Feathers is a four star coaching inn with a range of 23 en suite bedrooms which are all comfortably furnished with colour televisions and tea and coffee making facilities. Family rooms are available and children and dogs are welcome. Guests can enjoy a traditional Yorkshire cooked breakfast as well as cereals, fresh fruit, toast and preserves fruit juice, tea and coffee. Meals are served in the bright and pleasant, atmosphere of the atrium or in the Feversham Bar with its beamed ceilings and views across the market square. We use high quality local produce which is prepared with care in the hotels kitchens. The Pickwick Bar with its stone floor, original Mouseman furniture and open fire is the perfect place to enjoy our selection of cask ales.